There’s almost nothing that I like better than a freshly-baked pie. Growing up, I enjoyed my mom’s famous apple pies on special occasions – usually when we had guests over for dinner – and for breakfast the next morning. Although I grew up on the East coast, I know that there are some serious pie-bakers here in Texas as well. 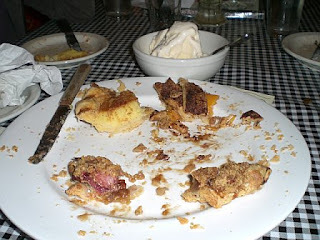 I recently planned a road trip with four of my closest girl friends to Round Top for a day of pie tasting at Royer’s. Not hurting for PR, the café was featured on the Food Network’s “Road Tasted”. There isn’t much else in the town of Round Top other than pie, as evidenced by their tiny population (77). However, many folks come out for the Round Top Antiques Fair and Shakespeare at Winedale. True foodies may want to check out the Blue Bell ice cream tour in Brenham – only 22 miles away. The creamery is open for tours on weekdays only. Us gals are serious about our food and wanted to make the most of this historic visit to Royer’s. Bud Royer understands this and has included a pie sampler plate on the menu with four slices of pie and a heaping bowl of Amy’s Ice Cream for $22.95. There were five of us so we decided to add another piece so as not to slight our growling bellies. We were not disappointed when the waiter brought our order to the table. Our favorites were the apple, strawberry rhubarb, and chocolate chip (in that order) with the sugar-free peach and buttermilk coming in last. Only one of us is a native Texan though so that might account for the low showing for buttermilk. Next time, I definitely want to try pecan and maybe the butterscotch chip pie. Here is a photo taken when we were in the 7th inning stretch. Wow, that is some serious pie-eating. Once Paul finds out about that place it’s all over! This is on my way from Houston to Austin…you had better believe that I’m stopping there on my next trip to see you guys!